acquistare viagra online generico a Milano One of my best designer buddies is Vickie Howell and her edgy design sensibility never ceases to inspire me. 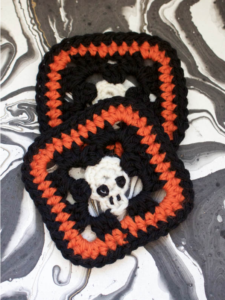 Vickie has done it again with these cute and spooky Halloween coasters. prednisone 1mg I love the clever center that looks just like a skull!! Vickie used chunky yarn and a Clover Amour hook so the coaster whips up super fast! http://maientertainmentlaw.com/?search=g-postmessage-finasteride-smiley-online In order to provide crochet patterns free, this website makes use of sponsored and/or affiliate links. Please see my About page for more info.